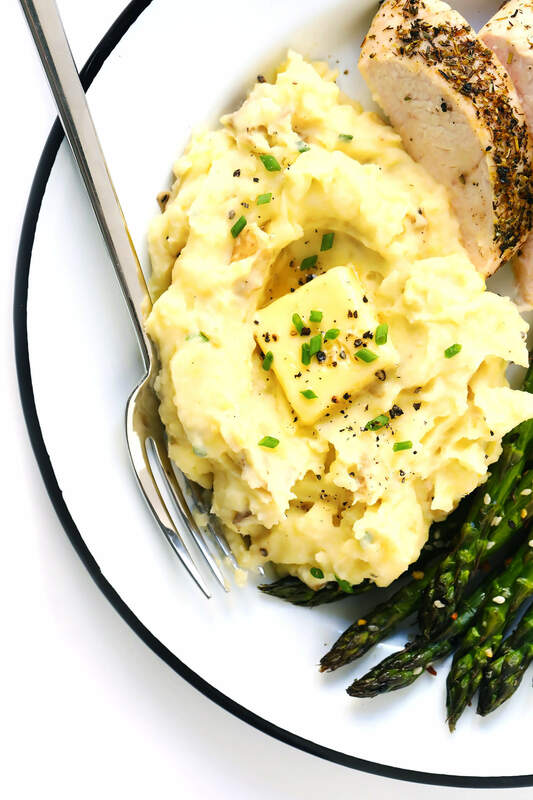 Presenting…my all-time favorite mashed potatoes recipe. These homemade mashed potatoes are perfectly rich and creamy, full of great flavor, easy to make, and always a crowd fave. Friends! It has come to my attention that in nine years of blogging, I have somehow neglected to share with you my go-to recipe for this most classic of classic side dishes. Which simply will not do with Thanksgiving — the ultimate side dish extravaganza — just around the corner. So today, allow me to present to you my tried-and-true, back-pocket, made-’em-a-million-times, always-a-crowd-fave, never-letta-girl-down, all-time-favorite mashed potatoes recipe! Now of course, everyone is entitled to their own opinions about exactly what constitutes the best mashed potatoes recipe. But if I’m the one put in charge potatoes for Thanksgiving, this recipe is my idea of perfection. These mashed potatoes are indulgently buttery, creamy, tangy, and made with a very subtle hint of garlic (which you’re welcome to amp up, if you’d like). They are perfectly dense and thick (not the whipped and ultra-light variety). They feature not one, but two popular kinds of potatoes (whose skins you are welcome to leave on or peel off). They can be as smooth or as chunky as you prefer. And they are simply so good. Oh, and they’re also incredibly easy to make and reheat in the microwave, if you have a busy menu lineup and would like to prep them ahead of time. Use a blend of potatoes. Some people have a strong preference for starchy Russet potatoes or waxy, buttery Yukon golds. But I highly recommend using a 50/50 mixture of both! It’s actually a tip I picked up from The New York Times years ago, and I’m convinced that the mixture gives you the best of both worlds. Cut your potatoes before boiling. I know, so many of us grew up boiling whole potatoes. But the problem is that large, whole potatoes cook unevenly. So instead, cut your potatoes into evenly sized smaller pieces for quick and even boiling. Don’t overboil. Or maybe the tip should be, don’t multitask too much near the end of the potatoes’ cooking time. 😉 You want to keep a close eye on them. And as soon as a dinner knife can be inserted easily into a potato with minimal resistance, they’re ready to go. Don’t overmix! In general, you want to stir the liquids into your mashed potatoes until they are just combined. Otherwise if you overmix, they can crossover into gummy territory, which is no good. Season with salt along the way. We will use fine sea salt to season the potatoes both (1) in the water while they are boiling and (2) afterwards, when adding in the butter, milk and cream cheese. As always when seasoning a recipe, taste-taste-taste along the way while you are preparing the recipe, and add more salt as needed. Potatoes: As mentioned above, I’m a big fan of using a mixture of half Yukon gold potatoes and half Russets. It gives you the best of both worlds — starchy and waxy potatoes — and they cook alongside one another beautifully. Although you are welcome to use just one variety of potatoes, if you prefer. 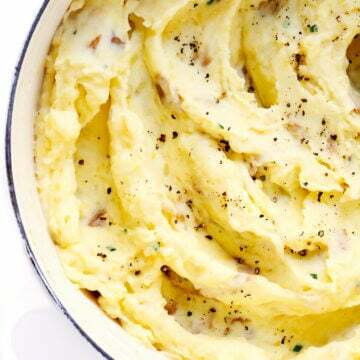 Butter: When I eat mashed potatoes, I go all-out and want them to taste nice and buttery. We don’t add as much butter here as many recipes do, but it’s definitely indulgent. If you are eating dairy-free and/or vegan, feel free to substitute vegan butter. Milk: I always use whole cow’s milk in my mashed potatoes. But you are welcome to amp things up with half and half or heavy cream, if you prefer. Or use something lighter, or turn to mildly-flavored non-dairy milk alternatives. Cream Cheese: I always grew up making mashed potatoes with cream cheese, and enjoy the slight extra tangy and creaminess that it adds. Be sure that your cream cheese is room temperature and cut into small 1-inch chunks, for easy melting into the potatoes. Fine sea salt: Which we will use to season the potatoes at different points while cooking. Toppings (Optional): I like to sprinkle on some chopped chives or green onions, for some extra color and freshness. Plus lots and lots of freshly-cracked black pepper. But feel free to add on what you’d like! Also, see below for more ingredient variations and add-ins to try. Cut the potatoes. Again, feel free to peel your potatoes or leave the skins on. (I always leave them on for the extra nutrients and flavor.) Then cut your potatoes into evenly-sized chunks, about an inch or so thick. Then transfer them to a large stockpot full of cold water until all of the potatoes are cut and ready to go. Pro tip: If you are prepping ingredients for a big meal ahead of time, the potatoes can chill in the cold water for up to 4 hours before boiling. Just add a few ice cubes to the water to be sure that it stays cold. Boil the potatoes. Once all of your potatoes are cut, be sure that there is enough cold water in the pan so that the water line sits about 1 inch above the potatoes. Add the garlic and 1 tablespoon salt to the water. Then turn on high heat until the water comes to a boil. And boil the potatoes for about 10-12 minutes until a knife inserted in the middle of a potato goes in with almost no resistance. Carefully drain out all of the water. Prepare your melted butter mixture. Meanwhile, as the potatoes are boiling, heat your butter, milk and an additional 2 teaspoons of sea salt together either in a small saucepan or in the microwave until the butter is just melted. (You want to avoid boiling the milk.) Set aside until ready to use. Pan-dry the potatoes. Return the potatoes to the hot stockpot, and then place the stockpot back on the hot burner, turning the heat down to low. Using two oven mitts, carefully hold the handles on the stockpot and shake it gently on the burner for about 1 minute to help cook off some of the remaining steam within the potatoes. Then remove the stockpot entirely from the heat. Mash the potatoes. 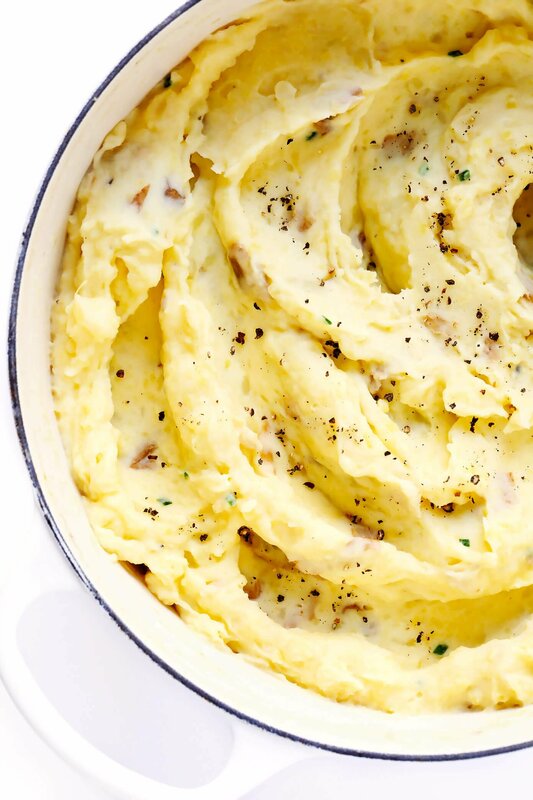 Using your preferred kind of masher (see above), mash the potatoes to your desired consistency. Stir everything together. Then pour half of the melted butter mixture over the potatoes, and fold it in with a wooden spoon or spatula until potatoes have soaked up the liquid. Repeat with the remaining butter. And then again with the cream cheese. Fold each addition in until just combined to avoid overmixing, or else you will end up with gummy potatoes. Taste and season. One final time, adding in extra salt (plus black pepper, if you would like) to taste. 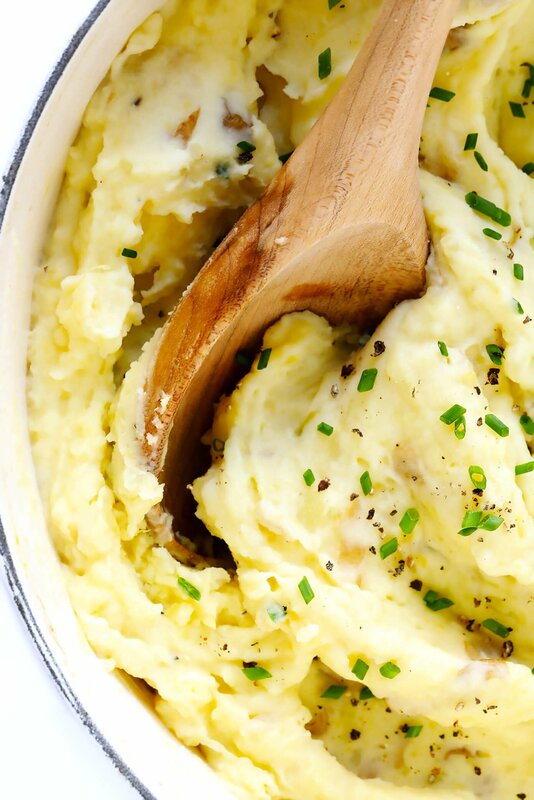 Garlic mashed potatoes: To make your mashed potatoes extra garlicky, feel free to double or triple the amount of garlic added to this recipe. Or, feel free to roast a head of garlic while the potatoes are boiling and add the roasted cloves to the mash for extra-rich flavor. Bacon bits: Freshly fried, and nice and crispy! Jalapeños: Finely diced, if you would like to add a kick. 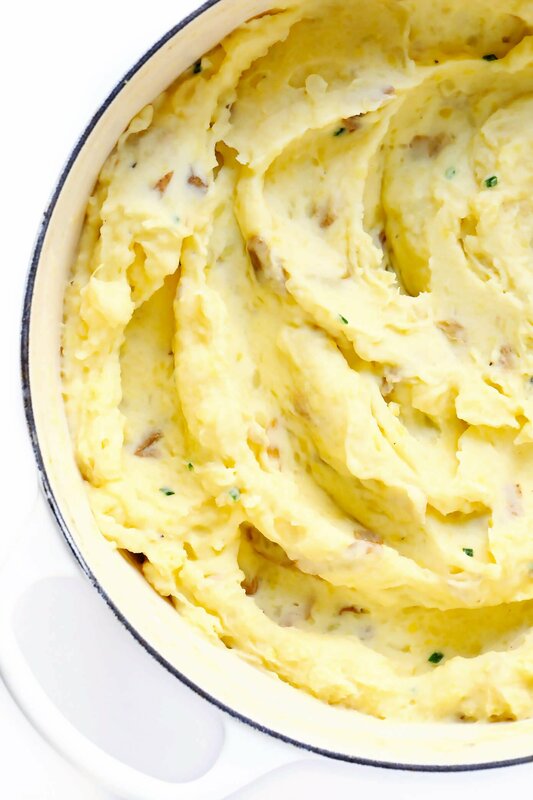 Vegan mashed potatoes: To make these potatoes vegan, sub in vegan butter, plain almond milk, and vegan cream cheese (or omit the cream cheese entirely, if you would like). Mashed sweet potatoes: To make mashed sweet potatoes, simply sub in sweet potatoes in place of your Russets and Yukon golds. 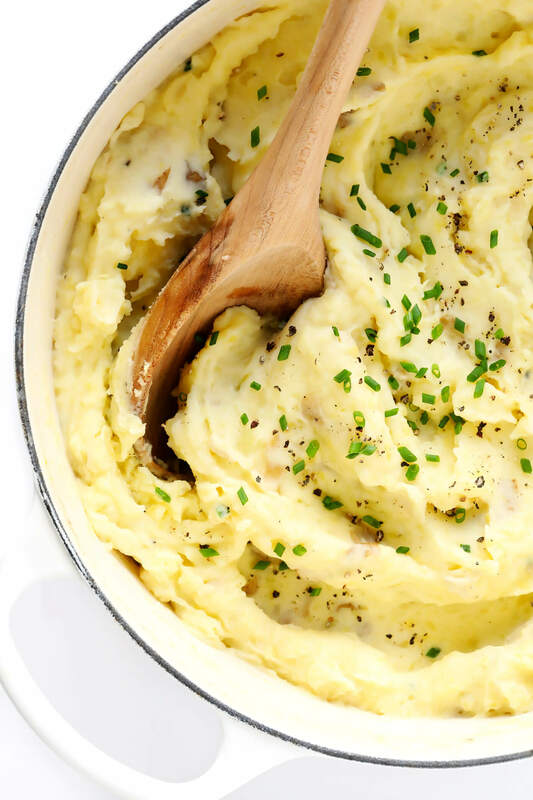 Mashed red potatoes: If you happen to be partial to red potatoes, this recipe will also work well using 100% red potatoes. 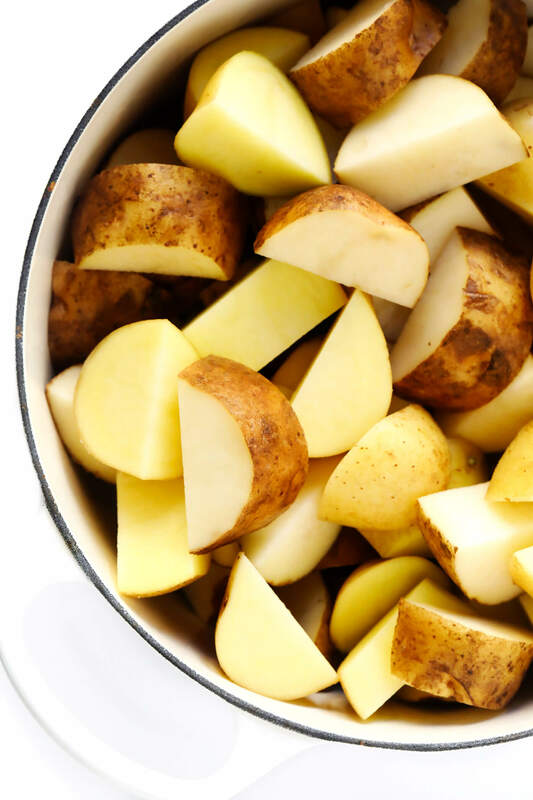 Soak the uncooked potatoes for up to 4 hours: If you would like to prep just the raw potatoes ahead of time, they can hold in a stockpot (or large bowl) of cold water for up to 4 hours. You can either store this in the fridge, or just add in a couple of ice cubes every few hours to keep the water cold. Microwave: Poke a few holes in the plastic wrap and microwave the potatoes on 75% power until hot, stirring every 3-4 minutes. Crock-Pot: Transfer potatoes to a slow cooker and heat on “high” for 1 hour, covered, or until hot. Instant Pot: Transfer potatoes to a pressure cooker and heat on the “warm” setting for 1 hour, covered, or until hot. Oven: Transfer potatoes to a large stockpot and heat, covered, at 350°F for 30 minutes or until hot. These homemade mashed potatoes are perfectly rich and creamy, full of great flavor, easy to make, and always a crowd fave. See notes above for tips and possible recipe variations. And also, feel free to halve this recipe if you would like to make a smaller batch. Cut the potatoes. Feel free to peel your potatoes or leave the skins on. Then cut them into evenly-sized chunks, about an inch or so thick, and transfer them to a large stockpot full of cold water. Boil the potatoes. Once all of your potatoes are cut, be sure that there is enough cold water in the pan so that the water line sits about 1 inch above the potatoes. Stir the garlic and 1 tablespoon sea salt into the water. Then turn the heat to high and cook until the water comes to a boil. Reduce heat to medium-high (or whatever temperature is needed to maintain the boil) and continue cooking for about 10-12 minutes, or until a knife inserted in the middle of a potato goes in easily with almost no resistance. Carefully drain out all of the water. Prepare your melted butter mixture. Meanwhile, as the potatoes are boiling, heat the butter, milk and an additional 2 teaspoons of sea salt together either in a small saucepan or in the microwave until the butter is just melted. (You want to avoid boiling the milk.) Set aside until ready to use. Pan-dry the potatoes. After draining the water, immediately return the potatoes to the hot stockpot, place it back on the hot burner, and turn the heat down to low. Using two oven mitts, carefully hold the handles on the stockpot and shake it gently on the burner for about 1 minute to help cook off some of the remaining steam within the potatoes. Remove the stockpot entirely from the heat and set it on a flat, heatproof surface. Mash the potatoes. Using your preferred kind of potato masher (I recommend this one in general, or this one for extra-smooth), mash the potatoes to your desired consistency. Taste and season. One final time, taste the potatoes and season with extra salt if needed. Serve warm. Then serve warm, garnished with any extra toppings that you might like, and enjoy! This recipe uses affiliate links.